Frontiers to Factories: Detroiters at Work, 1701 to1901 presents the story of the first two centuries of Detroit’s history in an exciting — and educational — way, telling the often-ignored story of Detroit up to the 20th century. 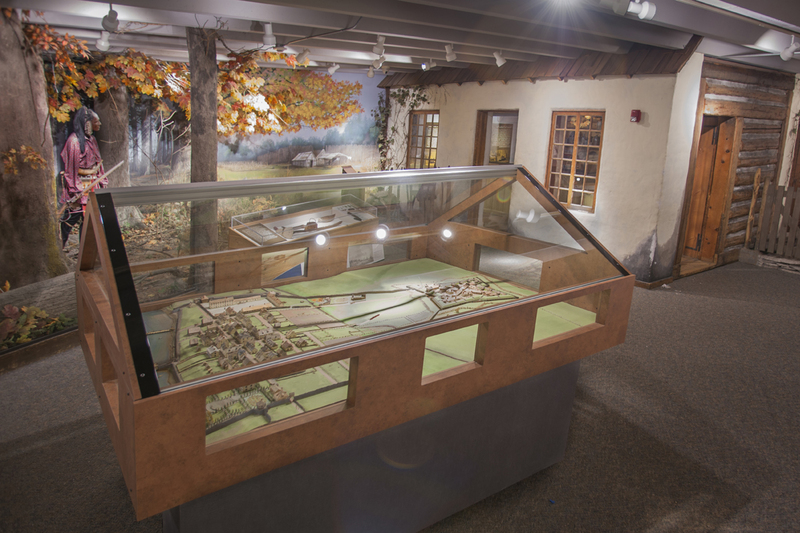 The entry area welcomes visitors and features and interactive map of the Great Lakes region, using fiber optic technology to illustrate major exploration routes into the area – with an emphasis on the route used by Antoine de la Mothe Cadillac when he founded Detroit in 1701. Visitors then move into a section that the story of the Native American people in the Detroit area before Cadillac and how they lived. It includes rare artifacts from the Museum’s collection. Covering the period from 1701 to 1825, the next section addresses Cadillac’s arrival, the growth of the village of Detroit, the fire of 1805 and the Woodward plan to reshape the city, the Moran Trading Post and French farming techniques. An interactive video presentation called “Early Detroiters” features a cross section of settlers from the area. As visitors move on through the exhibition, they encounter a section that illustrates the growth that took place from 1825 to 1865, as improved transportation via steamship and train brought more people from many ethnic backgrounds to Detroit. A touch-screen interactive called “From Many Places” explains why and when people from many ethnic backgrounds settled in the city. In addition, the first industries in the city and the people responsible for them are profiled. Another interactive, the land office “Wheel of Fortune,” gives visitors a chance to spin a wheel and learn whether or not they’ve made a wise land purchase in Michigan. Looking at industry in post-Civil War Detroit, the next area displays the stories of prominent industrialists and their companies and features a video interactive called “Working in Detroit.” The viewer selects a character and sees a short story on that individual’s role in late 19th century Detroit. Roles of both men and women of various ethnic backgrounds are presented. The exhibition then uses photos, graphics, large photographic backdrops, and artifacts, to show the national impact and prominence of Detroit’s major industries in the 1890’s, including railroad cars, ships and stoves. As heavy industry took root in the city, new businesses emerged to meet the needs and wants of Detroiters. Sanders, Kresge’s, Stroh’s, Hudson’s and Parke Davis were all Detroit institutions that came to prominence in post-Civil War Detroit. This display explains how these and other famous Detroit products and businesses were born. Within the span of 200 years, Detroit grew from its founding in 1701 as a French frontier outpost into a leading American industrial city. This exhibit leads visitors through the story of that change from a trading post settlement dealing in furs and agriculture to a metropolis boasting millions of residents and bustling with factories.